Are you the best Big Red fan? 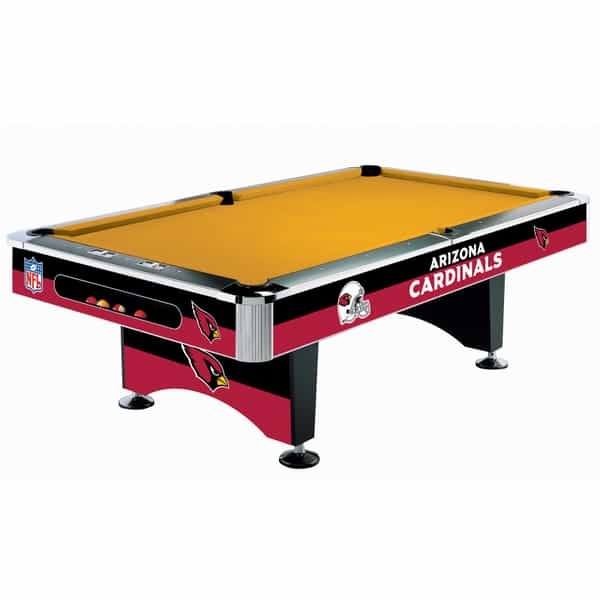 Only if you own this Arizona Cardinals Pool Table from Imperial Billiards and Family Leisure! Your fellow Bird fans will instantly be jealous when they see this billiard table. It's officially sanctioned by the NFL and your favorite team, arriving with free nationwide shipping, from Tempe to Tampa, to your doorstep from Family Leisure. All pool tables come with free nationwide shipping from Family Leisure, but this is the only model that comes with the cardinal, white and black colors, along with the official team logo of the Cards. Inside Imperial Billiards starts with metal-beam construction, and finishes it off with trusted slate, natural gum rubbers and 21 ounce billiard cloth, creating a high-quality pool table that will last. The construction, materials and craftsmanship alone makes the Arizona Cardinals NFL Pool Table a smart and safe investment.